2) Faculty of Dental Medicine, Medical University - Varna, Bulgaria. Aim: To evaluate the concurrent validity of the Hamilton Depression Rating Scale (HAMD-17) against ICD-10 criteria for depressive disorder and its performance as a screening and diagnostic tool for depression in patients with epilepsy (PWE). Subjects and Methods: One hundred and six PWE underwent clinical psychiatric examination followed by evaluation on HAMD-17. ICD-10 criteria for comorbid depressive disorder were applied. Internal consistency was assessed using Cronbach’s α. A “receiver operating characteristics” (ROC) curve was obtained and the sensitivity, specificity, positive and negative predictive values (PPV, NPV) were calculated for different cut-off points of the HAMD-17. Results: Internal consistency measured by Cronbach’s α was 0.74. Maximal discrimination between depressed and non depressed was obtained at a cut-off score of 8/9 (sensitivity 0.93, specificity 0.98). High sensitivity and NPV at the same cut-off score (sensitivity 0.93, NPV 1.0) show the screening properties, and high specificity and PPV at cut-offs 9/10, the diagnostic properties of the instrument. The area under the ROC curve (AUC=0.746) indicates the concurrent validity of the HAMD-17 score with the ICD-10 criteria for depressive disorder. Conclusion: The validity of the HAMD-17 against ICD-10 criteria for depressive disorder in PWE in our study is fair. The concurrent administration of diagnostic criteria can ascertain the presence of core symptoms of depression. Key words: Psychometric properties, HAMD-17, Epilepsy. Please cite this article as:Todorova KS, Velikova VS. The validity of the Hamilton Depression Rating Scale as a screening and diagnostic instrument for depression in patients with epilepsy. J of IMAB. 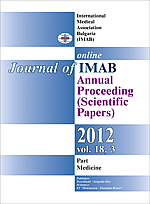 2012; 18(3):305-307. doi: 10.5272/jimab.2012183.305. 5. Kanner AM, Wuu J, Barry J, Hermann B, Meador KJ, Gilliam F. Atypical depressive episodes in epilepsy: a study of their clinical characteristics and impact on quality of life. Neurology. 2004; 62(suppl5):A249. 13. Muller MJ, Dragicevic A. Standardized rater training for the Hamilton Depression Rating Scale (HAMD-17) in psychiatric novices. J Affect Disord. 2003 Oct;77(1):65-69. [PubMed] [CrossRef].